Through perspiration we are constantly losing water over the surface of our skin. This has an influence on the state of hydration on our body. The lost water needs to be replaced by drinking. Especially elderly people are prone to dehydration because the water content in the human body is decreased with increasing age. Based on research papers about hospitalizations due to dehydration, more than a half a million cases per year were registered. The potential savings if those hospitalizations and the associate costs could be avoided are more than a billion USD. One possible way to address this problem is to measure the perspiration rate. This is where our humidity sensor SHTW2 comes in. With two SHTW2 sensors arranged in the right way, it is possible to measure the perspiration rate accurately. The constant transpiration, which is nothing else than evaporation of water through our skin creates a gradient of absolute humidity. This gradient is actually proportional to the perspiration rate. What we need to measure are two sensors which are placed in some kind of channel. 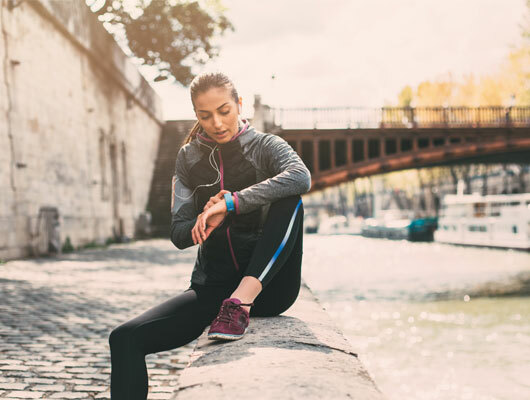 How much water do we loose through our skin over a day or during exercise? 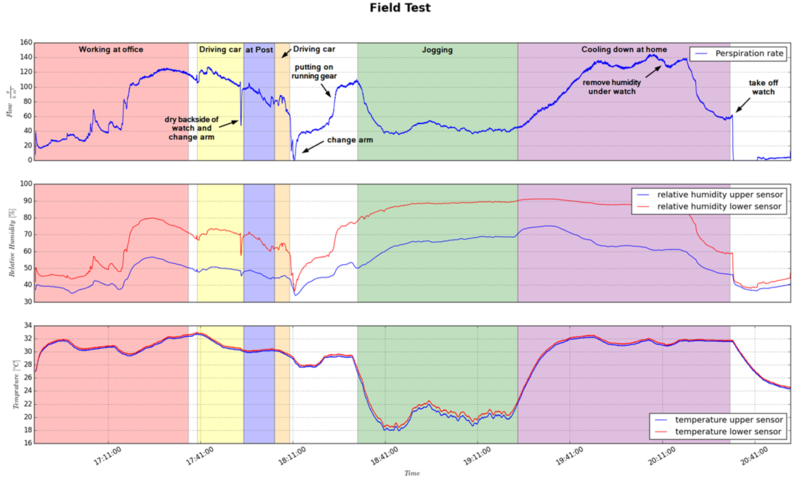 Does the rate of water loss (perspiration/transpiration) correlate with my performance? And if it does how can I measure it? If you have ever thought about one or more of the questions above there is an answer to each of them! These answers are delivered by a device we call "Perspiration Device". As of now (November, 2016) there are no devices on the market which can measure perspiration rates continuously or even in a small form factor. Our "Perspiration Device" resolves this and allows for a fast and precise measurement of the perspiration rate. The jogging was done at cool conditions (ca. 10C) with a moderate pace, therefore the perspiration rate was rather low during the activity in the cool environment. 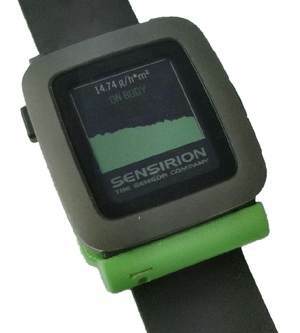 We built the following two devices: the bare "Perspiration Device" and a demonstrator with the "Perspiration Device" connected to the "Sensirion Wearable Development Kit". The underlying physical law for perspiration measurement is the diffusion equation that states how a collective of micro-particles behaves based on the random motion of each micro-particle (Wikipedia - Diffusion). We can put a hollow cylinder on the skin and measure the concentration gradient in order to get the perspiration rate (see figure below). The skin defines the lower boundary condition of the differential equation with a given rate of perspiration (Neumann boundary condition). Whereas at the upper end of the tube the concentration equals to the environment. However above calculation is not exact (not considering any transient effects or any surface effects) there needs to be a calibration factor, that we are able to determine precisely with a dedicated calibration setup, please contact us for more details. In addition, the process is temperature dependant, this can be addressed as well. Apparently this measurement principle saturates as soon as there is liquid sweat on the skin or more precisely at the body facing opening of the device. This happens obviously during phases of very intense sweating, but as can be seen in the plot, also when the surrounding absolute humidity is so high, that with the current perspiration rate the relative humidity reaches 100% at the body facing opening of the device. 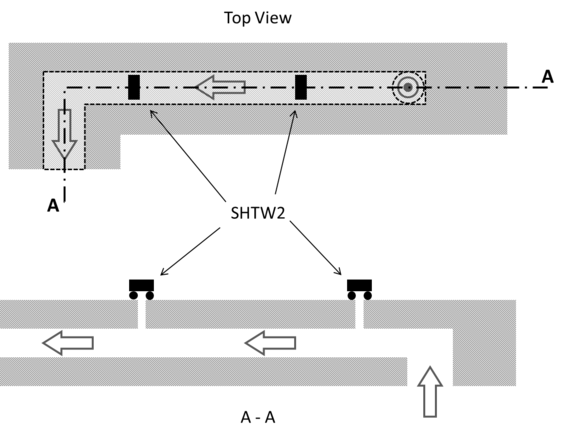 Three PCB's were stacked together to form a channel like depicted in the schematics below. 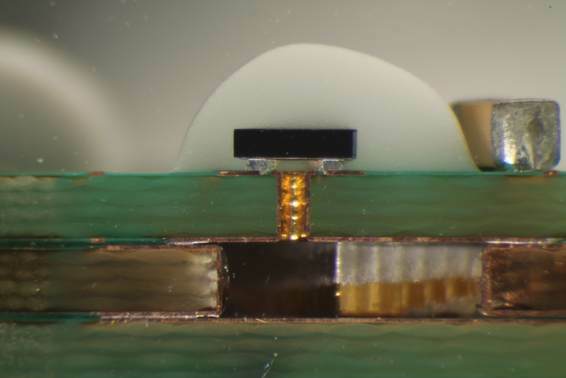 On top of this channel - visible for the sensor through a tiny hole (see top layer photos) - two SHTW2 sensors were placed to measure the AH gradient. However above principle is possible with a lot of different design-ins, this one is just one proposal. 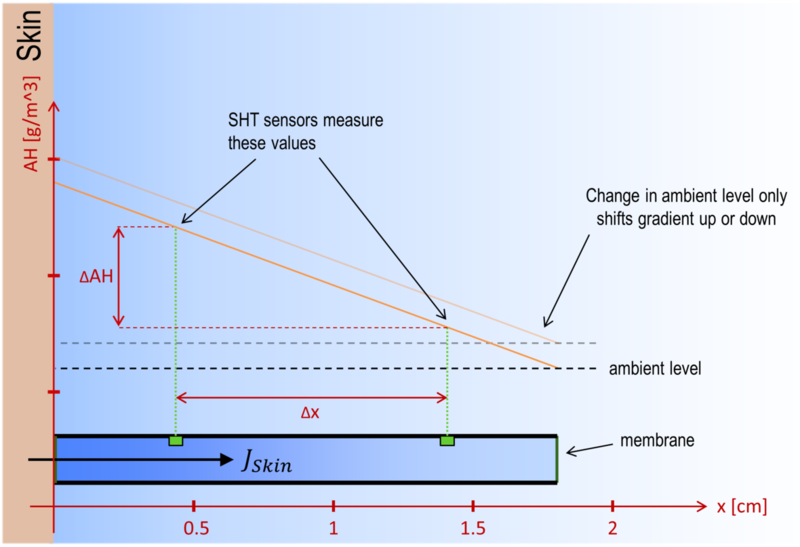 The code for computing the absolute humidity from the sensor values (relative humidity and temperature) and the perspiration rate is depicted below. In order to have a better signal we filter the raw temperature signal with a first order low pass filter (also see code below). 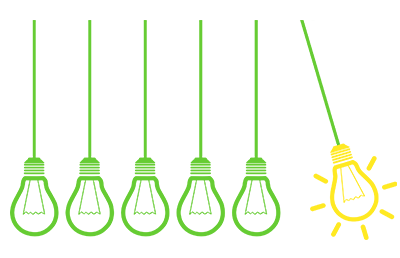 Aspects of this application are protected by Sensirion patent(s) US 8,838,037 B2, JP 5963481 B2 and/or other patents pending. For commercial licenses, please contact Sensirion AG.